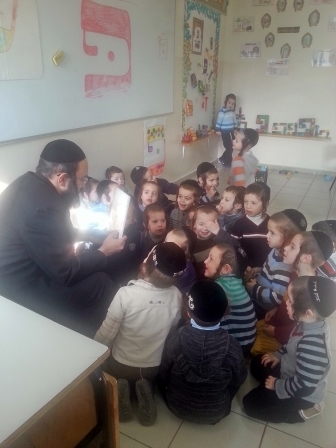 60 preschool groups in Bnei Brak and Beitar Illit enjoyed Yiddish story books reading them in their classrooms and borrowing one each week . Writer: Yitty Tabak – certified teacher and writer. To augment Achiya’s Language Skills Program, Achiya, in collaboration with Joint-Ashalim and the Israeli Ministry of Education, has produced 20 beautifully illustrated children’s books for use in Yiddish-speaking kindergartens. The children’s books are unique in that they were devised and designed by a committee of early education experts to be used all through the year in conjunction with the standard kindergarten curriculum. Why did Achiya choose to produce these books in Yiddish? * Yiddish books for children are not available to the same extent as Hebrew books. * A series of books written in Yiddish by early childhood experts particularly for Yiddish speaking preschool children will encourage them to speak the language perfectly. These children grow up in a bilingual culture speaking both Hebrew and Yiddish. They usually do not have a really good command of either of these languages. *The series of books is an educational tool for kindergarten teachers to integrate in the classroom curriculum. Research has shown that in mastering a rich, precise vocabulary in one language, children unconsciously integrate concepts necessary for future academic success, in all levels of learning. It also enables the ability to know and speak a second language at a similar level.